A WWII-era geographical pattern points the way to a successful U.S. strategy for the Asia-Pacific. In 1957, Hans W. Weigert, then a professor at Georgetown University, and five colleagues wrote Principles of Political Geography, which attempted to show “the interrelationship and the blending of political and geographic factors in power relations” across the globe. Although it was written at a time when the United States and the West faced the Sino-Soviet bloc based in the geographical “heartland” of the Eurasian land mass, Weigert’s analysis of the geographical features of the East Asian coast and its marginal seas continues to have relevance to current international relations, especially the ongoing struggles for power in the South China Sea and U.S. efforts to either contain China or act as an offshore balancer of the Asia-Pacific region. Weigert was born in 1902 in Berlin, Germany. Originally a lawyer, in 1938 he fled Germany for the United States as war clouds gathered over Europe. He went on to teach at Trinity College, Carleton College, and the University of Chicago. During the Second World War, Weigert wrote a book on German geopolitics, Generals and Geographers: The Twilight of Geopolitics (1942), which analyzed the writings of Karl Haushofer and other German geopoliticians, and edited a symposium on geopolitics entitled Compass of the World (1944). He also wrote articles and reviewed books on geopolitics and international relations in The Saturday Review, Foreign Affairs, and Harper’s Monthly. After the war, Weigert served with the U.S. military government and High Commission in Germany. To the extreme north, the Asian coast approaching the Bering Sea is geographically blocked by the curving Aleutian Islands. Next, the coast approaching the Sea of Okhotsk is blocked by the Kamchatka peninsula and the Kurile Islands. Further south, Sakhalin Island and the Japanese main islands serve to block the coast along the Sea of Japan. The coast of mainland China (and Indochina) along the East China Sea and South China Sea is blocked by the Ryukyu Island chain, Taiwan, the Pescadores, the Philippine Islands, Borneo, Malaysia, and Indonesia. 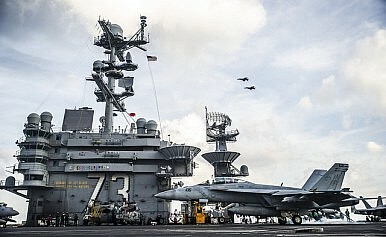 China today gives every indication that it plans to challenge the U.S. peripheral positions along the East Asian coast and become the predominant land, naval, and air power in the Asia-Pacific region. It is this development, more than any other, that is responsible for the ongoing U.S. pivot or rebalance to Asia. It is here that the most important geopolitical great power competition will occur in the 21st century. Hans Weigert’s geographical pattern points the way to a successful U.S. strategy of containment or offshore balancer.